The blueberries are amazing right now! I have been eating them as much as possible. But, since I don’t have a sweet tooth, I was struggling to find things to COOK with them. I was browsing Pinterest and found this awesome Polenta Bites w/ Blueberry Corn Relish recipe, from Girl Versus Dough, and was instantly intrigued. For my dish, I decided to turn it into a full meal, rather than just an appetizer. I also used cider vinegar instead of rice vinegar, because of its amazing health benefits. This dish is the perfect combination of sweet meets savory, creamy meets acidic. If you are hesitating because the relish sounds strange, DON’T! Everything went SO well together! 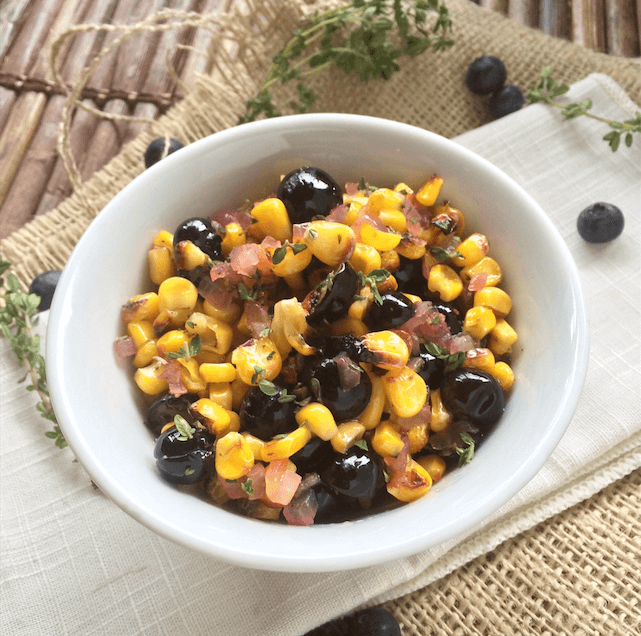 Combine the corn, onions, blueberries, thyme, 1 T oil and vinegar in a small bowl; set aside to marinate. Add the shallot and garlic, cooking until fragrant. Add the polenta, water and milk and cook until the polenta is soft, stirring constantly. Remove from heat and add the cheese, lemon zest, salt and pepper to taste. 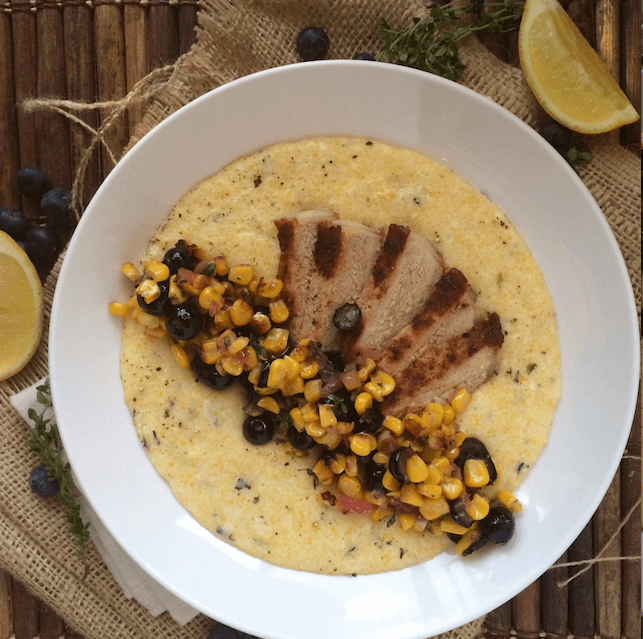 Serve polenta with blueberry relish and pork chops, if desired. Wow, this sounds like such an interesting combination! 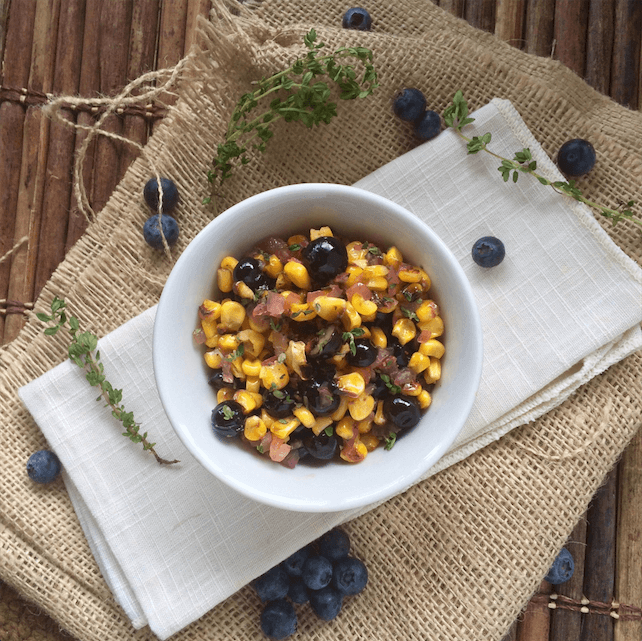 Blueberries, corn and pork? Yum! I am loving this weather right now, too. I am from Massachusetts, but we’ve definitely had our fair share of snow as well.